Yikes! There is a whole pigs head for $100.00 on the menu, then in small print…..need 72 hour notice. We decided to dine at Crudo, a restaurant that my husband has been wanting to try. It is an Italian fusion type of place that specializes in raw, cooked and grilled seafood, cheese plates, pig ears, chicken hearts and bone marrow. I knew that this restaurant would be a challenge for me to find something that I would enjoy but being the open minded person that I am (insert see honey I am open minded) this salad spoke to me on all levels. Loved, loved it……. P.S. Beside the salad I had the fresh tuna with grilled kale and cauliflower and it was delicious!! 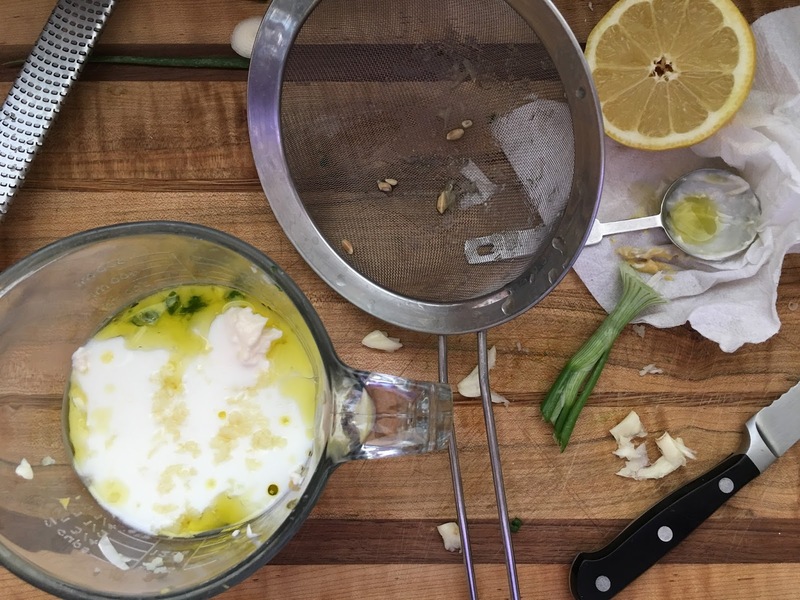 Recipe for Southern Buttermilk Salad Dressing is from Mark Bittman and Sam Sifton. On serving platter combine all salad ingredients, mix lightly. Combine and mix everything except the buttermilk, then add buttermilk and whisk until smooth. Your will have leftovers, store in a covered glass jar and refrigerate up to 5 days. Wow!!! You are open-minded AND a good sport😊 Buttermilk dressing was a childhood favorite. Thank you for the how-to 😊Ps Beautiful photo of the salad too! Thanks Kim, there really is something for everyone there and everything is delicious but i'm not sure I could sit next to a table with a head on it. Thanks Kushi, we enjoyed this one very much. Hi Tandy, I know it sounds really bad doesn't it. Take care! What a lovely simple dressing. I love adding dijon mustard to my salads dressings too. Thanks Dannii, it has such a wonderful tang. You are open-minded! : ) And great you enjoyed the meal. Salad looks great...I always crave crunch and a zingy dressing to go with it sounds perfect. Thanks Monica, so do I. First, I can't wait to try Crudo! Second, the salad sounds terrific! Hi David, yes I bet you would love that place, my husband had the lamb risotto and loved it. Thanks Dena, we love to try out places that we have never been to before. What did your husband order? Glad you found items on the menu that you enjoyed. Hi Norma, my husbad ordered the lamb risotto and love it. The salad sounds fantastic and LOVE the buttermilk dressing. I don't do Offlal and things like heart and liver or a head for that matter you are a might good sport and what you had sounds wonderful. Hi Suzanne, sounds like you and I are on the same page. Take care! I think you hit the jackpot with this salad! Hope your hubby found something as good! Hi Chris, he was happy as a clam with lamb risotto. Congratulations on being open minded. I'm usually adventurous but these days I'm a bit more hesitant. I give you oodles of credit for going for it! Your meal sounds perfect and that salad dressing, well, thank you so much for sharing the recipe. I love all the ingredients! Thanks Louise, we both love to dine at restaurants that are new to us but sometimes it is just as nice to eat at home. I love everything about this salad, such a great flavor combination! Hi Tricia, you are too funny, love it. Hahaha, 72 hours - and a pigs head....that would be such an interesting experience, but I don't know if I could do it lol. This salad on the other hand - it looks delicious! Totally going to be trying it when the farmers market opens by me! Hi Phi, it was a great place, a little different but nice. Fabulous and gorgeous recipe, Cheri! This salad with buttermilk dressing is just beyond delish! Dear Cheri, sounds like one interesting restaurant and one wonderful, delightful salad recipe, dear friend! Yes it was Andrea, don't you just like to try different places and the salad was the highlight, take care! Mniam mniam! Looks really quick and easy to prepare. Perfect as a lunch!! MNiam! Thanks Sue, just checked out your post, your salads look amazing, great tips too!! Woo hoo! Pigs head and only 42 hours notice. After growing up on a farm, don't know if I could stomach that. Great salad!!! Hi Pam, how cool to have grown up on a fun, take care! I would pass on the pig's head too :) Great choice on the salad and your recreation looks delicious! Hi Susan, I know pretty crazy right. Have a great week. Hahaha, Cheri! I consider myself open minded too but I'm not eating ears, heads or organs! Gorgeous salad with great flavours. Thanks Robyn, I know pretty wild right? take care! Yes, your salad looks amazing! I wonder how often they have to make pig's head?? LOL,no, thank you!! Hi Liz, I asked the waitress and she said about once a week, pretty surprising right. This salad looks so good, Cheri, and you can't beat the taste of homemade dressing! Thanks Nancy, I agree homemade is always better.